Dozens of rescue boats battled strong winds, high waves and poisonous fumes to comb a 900-square-nautical-mile (3,100-square-kilometre) area for 31 missing sailors and tame the fire, amid growing concerns the listing ship may explode or sink. 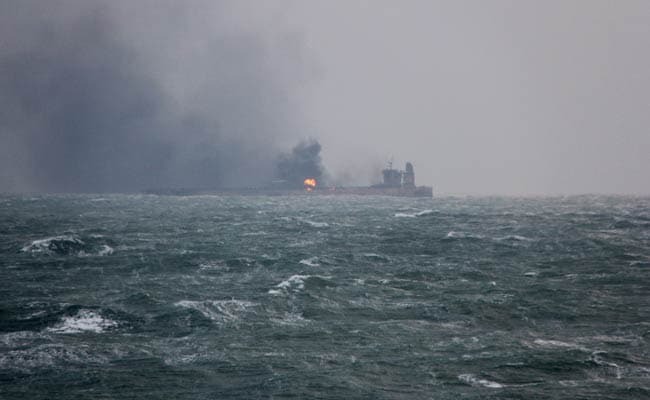 Seoul: A stricken Iranian oil tanker in the East China Sea could burn for as long as one month, South Korea's Ministry of Oceans and Fisheries told Reuters on Wednesday, as the blaze raged for a fourth day following a collision with a freight ship. "We believe flames would last for two weeks or a month considering previous cases of oil tank accidents," said official Park Sung-dong. "What we are concerned about at this moment is the bunker fuel, which could contaminate water if (the ship) sinks," the ministry official said. The tanker Sanchi, run by Iran's top oil shipping operator, National Iranian Tanker Co, collided on Saturday with the CF Crystal, carrying grain from the United States, about 160 nautical miles (300 km) off China's coast near Shanghai. The Sanchi was delivering 136,000 tonnes of condensate, a highly flammable ultra-light crude, to South Korea. The cargo of about 1 million barrels is worth some $60 million. The Chinese government said late on Tuesday it had not found a "large-scale" oil leak, and the condensate was burning off or evaporating so quickly that it would leave little residue - less than 1 percent - within five hours of a spill. That reduces the chances of a crude-style oil slick. Still, condensate is highly volatile when exposed to air and water and concerns were growing the tanker could explode and sink. The ministry official said authorities suspect the tanker caught fire as soon as it hit the freighter carrying grain. Park said it's unlikely the oil will spread to South Korea at the moment because the tanker has moved 100 kilometres (62 miles) to the southeast. Authorities and environmentalists worry the ship is increasingly vulnerable to breaking up and sinking the longer the blaze rages. If that happens, it would potentially expel the tanker's bunker fuel, or the heavy fuel oil that powers a ship's engines. Bunker fuel is the dirtiest kind of oil, extremely toxic when spilled, though much less explosive. Fuel oil is relatively easy to contain because volumes are lower and its viscosity means it's easier to extract from water, but even small volumes can hurt marine life. "The problem is the ship's heavy bunker fuel," said Chauncey Naylor, a U.S.-based director of emergency response and training at Tyco Corp's oil-fire specialists Williams Fire & Hazard Control, which is not involved in the clean-up. "It burns real slow and it's heavy and will lay on the ocean and on any twisted metal and create heavy smoke. It's the stuff that spills and gets on birds." The Zhoushan fishing ground where the collision occurred is known as one of the biggest in the East China Sea, particularly for mackerel and croaker, according to Greenpeace. In 2106, the catch from the East China Sea was 5.18 million tonnes, making it China's largest fishing ground. A Suezmax tanker can hold a maximum of 5,000 tonnes of bunker fuel to keep it running. The Sanchi may have been carrying about 1,000 tonnes by the time it hit the grain freighter, according to bunker fuel traders' estimates.